When a Spring-like temperature tease hits in February, it can throw your clothing choices for a loop. A week of unseasonably warm weather tends to take my mind and wardrobe to tropical places. Spring break, anyone? The piece that immediately surfaces is the one-and-done — and no, I’m not talking about Duke basketball sensation Zion Williamson. In the language of fashion, the one-and-done means a one-piece garment. Call it a jumpsuit or a romper, either way it makes the perfect one-piece ensemble. The one-and-done comes in all shapes, lengths and styles. Yes, your first image might be a sleeveless short romper that you see on a summer beach vacation, but the choices are almost endless — from casual denim to dressy velvet. 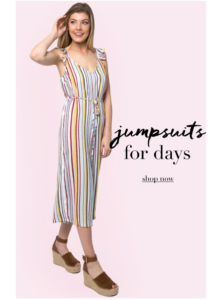 You can find jumpsuit styles with everything from ruffles to casual comfort to pocket details to chic and sleek silhouettes. You can shop all jumpsuits you saw above here. The Fashion Plate walks the blue carpet at Chapel Hill’s Varsity Theater for a GAA sponsored Oscars Preview. The benefits of the one-and-done add up. You can expect effortless, easy style every time you put one on. Plus, adding a jumpsuit or romper to your wardrobe makes packing a breeze. Less to pack means a lighter suitcase — and more room for splurges at your destination. But the real beauty of the one-and-done is the year-round options for wearing. If you own a sleeveless jumpsuit, just add a sweater or moto jacket as the temperatures dip. The one-and-done isn’t just a simple and stylish choice, it’s also endlessly customizable! How about a holiday soiree, a non-profit gala or that Valentine’s dinner date? Pull out the one-and-done. 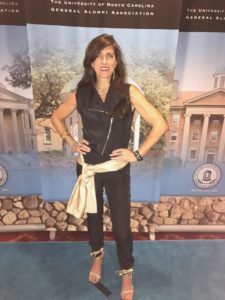 A black velvet sleeveless jumpsuit was my Dining Divas holiday outfit two years ago, and the look works just as well today as it did then. Change the look with your shoes and a sash, and don’t be afraid of doing something different! February is the perfect time to try that red lace look or blush pink one-shoulder jumpsuit — and don’t forget an elegant bejeweled jumpsuit for those red carpet award show romps! Some of my favorite jumpsuits can be found here. From the beaches of paradise to a glamorous night on the town, the one-and-done wonder can you take you just about anywhere. So, what to wear on this glorious 78 degree February day in Chapel Hill, NC? Time to put on a one and done!